After using the yarn for the caretaker's hat that I'd originally bought to make Deane some fingerless mitts, I got to thinking about all the stuff I'd promised to make people and hadn't yet made. Whether I'd promised the person to their face, or just in my head, is inconsequential. To me, they're both the same. So I decided to compile a list of everything I plan to make both for others and myself, with a goal to try and finish, if not all, at least the majority of them by the end of the year. 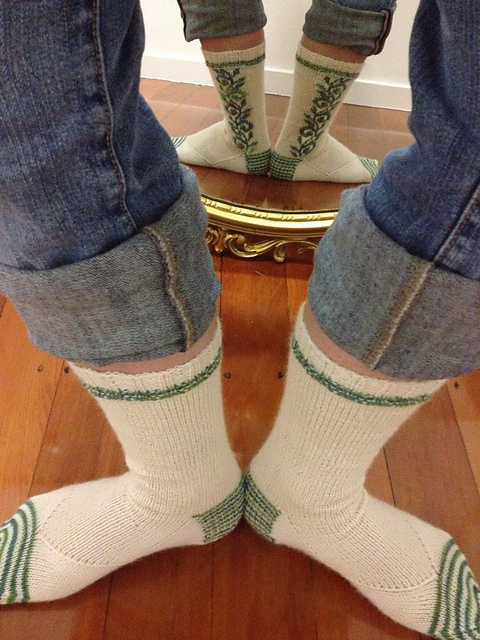 I'm eagerly awaiting the release of the round seven socks, which is due out between 1 and 2am NZ time - I don't need to knit them as I'm out of the competition, but the specs are very interesting, and there's been a lot of speculation about what technique will be used (much discussion about twined knitting). Can't wait to see what it is! Previous years' Mother's Day celebrations have been a little lackluster in the kreachr household - last year was forgotten entirely, much to my annoyance. So I was a little dubious about this year. I didn't want to poke and prod and have to remind the family, although I was very, very tempted to do so. I had to bite my tongue several times. I was even more worried that it would be overlooked again, when Deane wandered up to bed a little after 3am on Sunday morning. Only four hours until my usual get-out-of-bed time. I wanted pancakes! How can I be sure he would wake up, get out of bed, and make the buttermilk pancakes I'd been fantasising about for days, when he clearly wouldn't have had enough sleep? I stayed in bed, just relaxing, and thankfully was given a small blessing in the form of T, who wandered into the bedroom at around 8am for a cuddle. Me: "Do you want some breakfast?" Me: "Shall we get dad to make pancakes?" I managed to lie in for a while longer as the pancakes were being cooked, reading a little Catching Fire (the second Hunger Games book), then meandered down for the lovely pancakes and a pot of tea. Time enough left for a shower and hair-dry before wandering off to my usual Sunday afternoon knitting session at the library, then home again for Family Movie Sunday - we watched Gremlins. If you're wondering why I'm standing like that, it's because I was trying to get the 'zip' and button as well as the overall design of the houses on the socks into the picture. These were really fun to knit, using a technique I'd never even heard of, let alone tried! It's called roosimine, and the patterns are called roositud patterns. The method involves 'weaving in' the contrasting yarn as you go. Once you get the hang of it, it's quite easy. The hardest part is getting the tension right. But it's easily adjustable once you've finished the pattern anyway, so no real issue there. 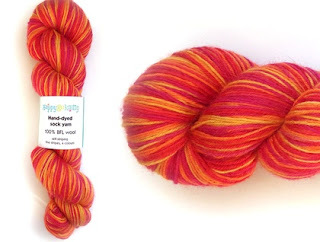 The whole round was over in three days, which I think might even be a Sock Madness record! (Not including the last round, which is ridiculously quick and only involves the super fast knitters left in each team). 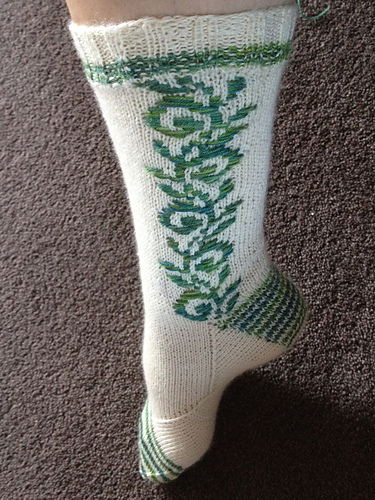 This pattern was Roosimine, and I knit them with 'naked' Skeinz sock yarn, left undyed from last year's Sock Madness, and some Cascade Heritage Silk Paints that I bought in America. These are going to my mum for Mother's Day. A little late, but that's okay with her. Life has returned to normal in the household of kreachr (well, that depends on what you consider 'normal' to be, but I guess it's our kind of normal) - the boys are at school, complaining about homework, fighting over who played longer on the XBox or the computer etc etc. Deane is back to working late and not being home in time for dinner. I just submitted my second assignment, and started the third module only to discover a very large bump in the road. I'm awaiting a reply from the tutor, so in the meantime I'll hang out here and update y'all on the goings-on. Knitting has been sporadic, for obvious reasons (see last two posts), but I have managed to get a few projects finished. Aren't they beautiful?!? The pattern is I Want to Beleaf, and it was knit in Vintage Purls 'Sunshine', which was an exclusive Summer Sock Yarn Club colourway for the Demelza shawl, which I liked, but thought was a little too... open... for my tastes. On to the next pair of socks! The pattern, conveniently, was released while I was online checking Ravelry. It came out quite quickly after the previous round was finished, because the designer was going away and wouldn't be available for questions if they left it too long. Worked for me - I was the first one finished!! Ahaha, the things we do to our children!! Making X model the hat for me so I could get a good picture of it before it was wrapped up and sent to Napier with my parents, who would hand it over for me. The pattern is the Cream of Celery Soup Hat, and it looks fantastic knit with stripes, but I like it knit in one colour too (plus I was trying to use up the yarn!!). Don't you think? Have a good week! !